I had the best intentions of surprising my critics by bringing you yet another recipe. Something I simply cannot stop eating. It goes by many names: patra, patrode, patrado, patode; we call it alu vadi where the alu is not to be confused with aloo. The latter is the Hindi word for potatoes whereas the former is the Marathi word for taro leaves. To begin with, the 'l' sound is different: ळ in alu as opposed to ल in aloo. If you can't hear the difference it's probably because you are used to a different range of sounds. 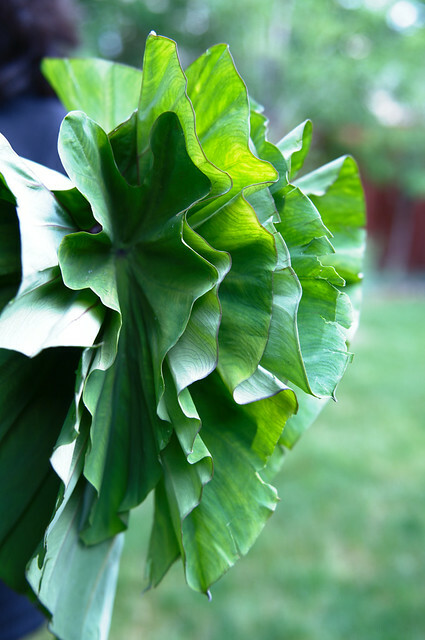 I maintained a stoic outer countenance while my inner child whooped in delight when I found these luscious taro leaves at the Indian store two weeks ago. This is the first time in over a decade that I have had the pleasure of seeing these leaves. I also bought some taro roots with - again, best intentions - of planting them and growing my own taro leaves but that's fodder for another post. 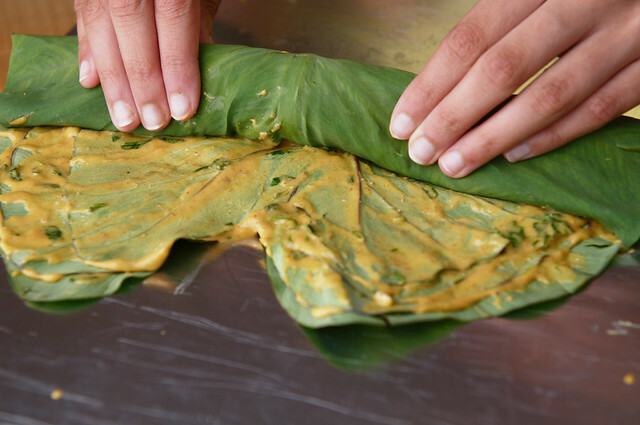 I borrowed some younger and prettier hands to help spread the chickpea batter onto the leaves, after washing them and flattening the central rib. Tamarind is supposed to be an essential ingredient as it counters the itchy feeling that some people get in the back of their throats.I added plenty of tamarind in the batter as I like alu vadi to be tangy. We made two rolls and steamed them in my dhokla steamer for over 40 minutes because that is what Anita advised. I shallowed-fried the steamed vadis in hot oil sprinkled liberally with mustard seeds for another 5-7 minutes at the very least. Rasachandrika: Saraswat Cookery Book, has four variations for alu vadi, two of which have onions in the batter. I went with the variation that was closest to what my mother used to make, sans onions. I should have clicked through to Elaichi Etcetera and followed the advice so generously shared by the long-absconding Vee but my phone was almost out of charge and the light was fading rather too quickly, indicating dinner time was nigh. While I started getting uncomfortable after eating several of these, Medha showed no reaction except to reach out for more. And who could blame her, for they were delicious! Her father? After eating his third alu vadi, he had a burning sensation at the back of his throat, followed by a great deal of pain. No itching. Just searing pain. Luckily, he did not have trouble breathing else it would have been the fastest 911 call ever made. In less than a half hour, he was curled up in a fetal position as he had sharp shooting pain in his abdomen. Calcium oxalate, people, don't take it lightly! Although not an allergy, it is treated like an allergic reaction and soon the poor fellow was on anti-histamines. Call your doctor or your sister or your niece, if they are doctors, and get medical help immediately. Luckily, taro leaves are on the milder side of the spectrum when it comes to edible plants that contain calcium oxalates. If you have a pet or are in the process of adopting one, get rid of that innocuous dieffenbachia plant in your home. It's pretty but it's toxic for the same reason. According to the advice shared by Vee on Pel's blog: break the stem of an arbi (taro) leaf you intend to use, rub the juice on your inner wrist and count to ten; if it stings, the oxalate concentration is too high. Don’t use them. I won't be testing this theory. Ever. Needless to say, I wasn't particularly sorry when I pitched those alu vadis into the compost bin. While he writhed in pain, he looked up at me and said: You're not planning to share this recipe on your blog, are you? That was the plan but not anymore! There are enough recipes on the blogosphere for alu vadi. This might be the one of the few posts with a first-hand report of what it feels like to have a toxic reaction to taro leaves! But to please my detractors, instead of a recipe, here's a Handy Tip that I alluded to in my recipe for kheer. 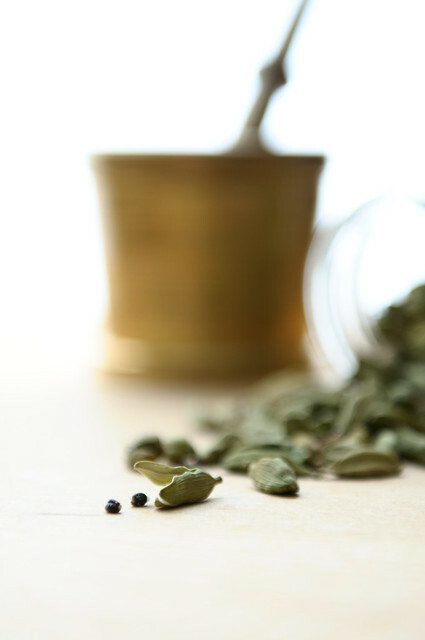 Any spice hound will tell you that most of the aroma from cardamom is in its seeds. They will also tell you that it is preferable to buy whole cardamom instead of ground cardamom, as the seeds start losing their flavor quickly when ground. However, be aware that even whole cardamom pods lose their flavor rapidly. The pods should be stored in a cool dark place and used within a year. Also, green cardamom pods have a far superior fragrance to the yellow or white ones, which may be bleached. My tip to you is: Don't throw away those outer husks. 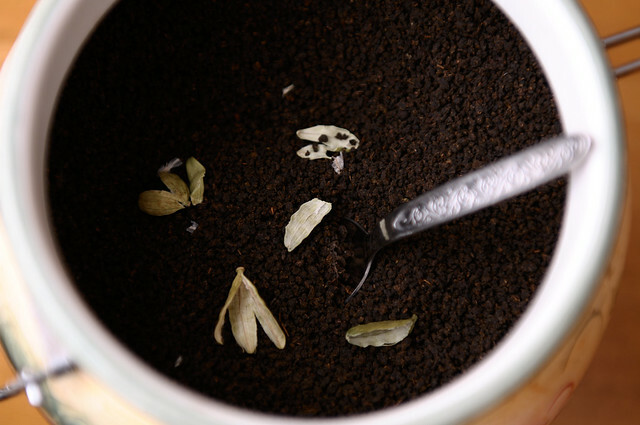 Instead, toss them into the container in which you store your tea leaves. The outer husk of the cardamom pods may not have as much fragrance as the seeds but they add a wonderful aroma to your tea leaves. If you don't buy loose tea leaves and still use tea bags, I have only one thing to say to you: Why? Nice tips, Manisha! Love those bracelets! ooh wonderful snaps and the dhoklas looks very tempting. 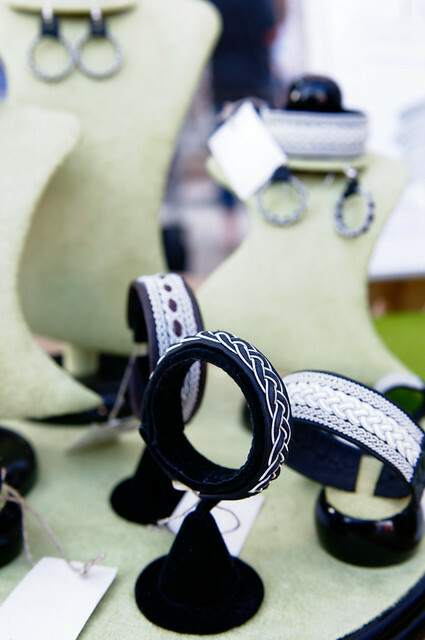 Love the bracelets too. New here,had been here couple of times earlier, but lost your link then. Loved your space, especially your writing and snaps. So hows your husband now ? hope he is doing fine. :-) Poor D. Poor you too; for those wadis are a lot of work. What a waste of labour. I can see that your intentions were truly to share an awesome recipe but we understand! They did come out looking perfect though! I hope D hasn't sworn off eating them though! OMG! That is severe reaction. Hope D is better now. Everyone has there own way of testing for edible Taro leaves. But My Mom always used those with Black stems. Yes but Alu vadi can still be unpredictable, on so many instances we have thrown them out and so many when we have gorged. I hate to take risk so I get to enjoy them only when I visit my SIL, who is an expert at picking them. I think Anjali's tip of choosing the leaves with black stems is what was given to me too. But, I stopped making these since I found the frozen variety and then stopped eating those after gorging on them and getting tired of them! I do the same with the husks of cardamom except sometimes I add them in the sugar instead. I do use tea bags but not to make tea. I add it while pressure cooking chana for that blackened chana color. Hope D is feeling better! I was introduced to those taro leaf rolls at my gujurati best friend's house 10 years ago and have loved them ever since. Wish I could get those leaves where I live. oops that is one nasty reaction! Anjali is right, that is how I choose the taro leaves. 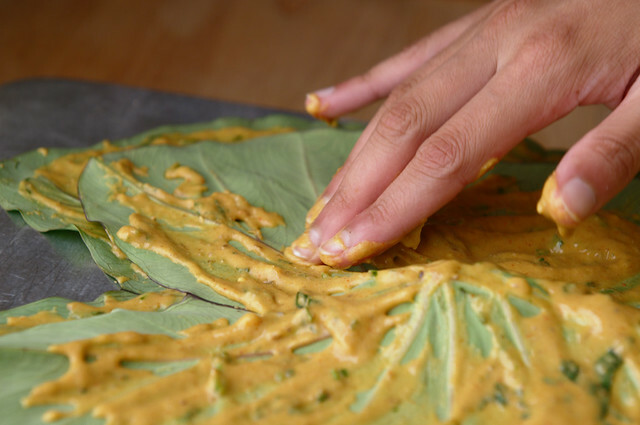 It seems running a rolling pin on the underside of the leaves before applying the paste also helps! I like what you say. But somehow, these days i prefer ordering the ready to eat indian food like this wadi from an indian store. I can now get my ready to eat stuff without having to make it for ling hours..
and actually speaking the taste remains same for me. My Mom's friend used to make them (patrawade)and I always avoid them because they make my throat itch, even when no one else reacts to them. That picture of them is lovely, though. You can also put the empty cardamom pods to make cardamom sugar. Musy, thanks! 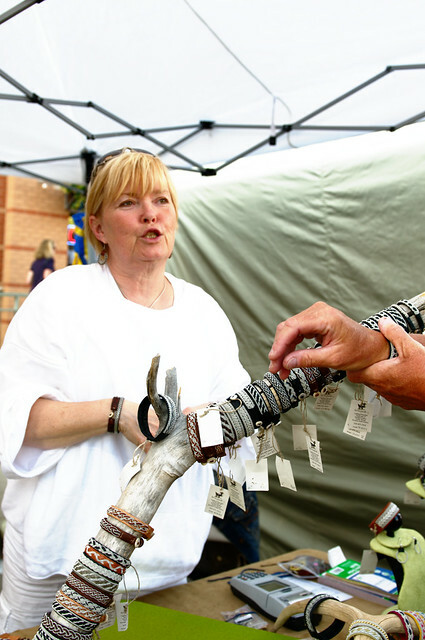 And I loved the bracelets, too! Kanchan, glad to see you found your way back! Luckily he recovered by the next day but was feeling a little wiped out. Thanks for asking! Anita, I think I will stick to safer broad green leaves in the future! I don't think he'll eat them again. I'm certainly not going to bring any home in any form or shape! Anjali, thanks! That's good to know. All of these had darkish stems, not black though. Jaya, the frosen cooked ones are way too oily. One of these days I hope to be able to figure out why chhole / chana needs to be dark in color! Xiaolu, how interesting! I love them, too! You could substitute taro leaves with collard greens. 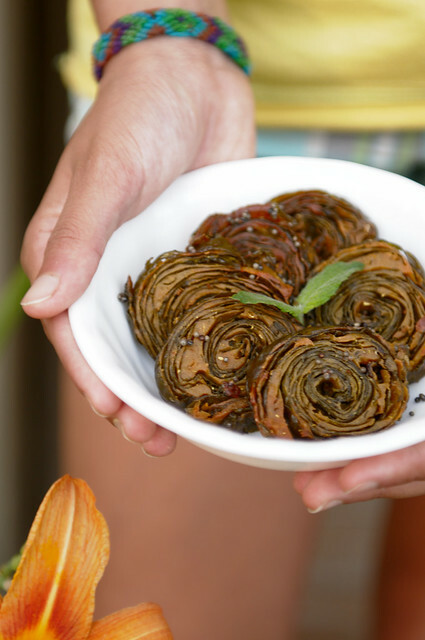 Check out Shilpa's recipe. Aqua, how does the rolling pin help with the reaction? I am intrigued. I would assume it helps to flatten the ribs some. Chetan, what you just did is called a link drop. Please don't do that on my blog again. Aparna, I think maybe some people are just more sensitive than others. Cardamom sugar is a great idea! Thanks! Good tip! Am going to put those cardamom shells on the tea container henceforth. Sorry I missed this post somehow! I felt incredibly bad for D! Glad he recovered.